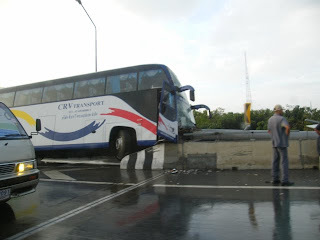 However, despite its horrendous reputation driving in Thailand isn't quite as bad as many people would have you believe!!!! But, I would advise caution and it's not something to be undertaken lightly or by those of a weak constitution!! I once vowed that I would never drive in Thailand, but, on my last trip to the Kingdom, I broke that promise and drove for the first time. We travelled from Bangkok to Pai via Ayutthaya, Sukothai, Phitasanlouk, Chiang Mai and Mae Hong Son, then back to our home in Banglamung near Pattaya, a road trip of several hundred kilometres!!! Having returned in one piece and not having been forced to pay any "tea money" to the boys in brown, I can state categorically that this won't be the last time I get behind the wheel of a car in Thailand. Unlike going on public transport or on an organised tour, driving gives you complete flexibility and control over your itinerary. It is also a good way to experience the country and culture. You will see lots of unexpected things and be able to interact with Thai people at roadside shops, restaurants, markets and when asking for directions. My girlfriend also likes to travel in the pick-up because it means we have more space for her shopping!!! I would like to offer the following advice to anyone considering driving in Thailand. 1) Drive on the left. Although most other road users appear to drive anywhere they like, officially they're meant to be on the left!!! 2) Watch out for motorbikes. Even on a deserted country road, a motorcycle is quite likely to appear from behind a bush and pull out into the road without looking!!!! Also be aware of motorcycles when turning into side streets and at junctions. 3) Watch out for animals. In the more built-up areas the main culprits are dogs, they will run out into the traffic causing cars and bikes to swerve or stop suddenly. In more rural areas you have to watch for cows and buffalos grazing by the roadside!!!! 4) Try to stay calm and avoid confrontation. You will need plenty of "Jai jen"(or cool heart), as your patience will be sorely tested by other drivers, speeding, flashing their lights, constantly swapping lanes without indicating or using their mirrors and the general lack of courtesy!!! 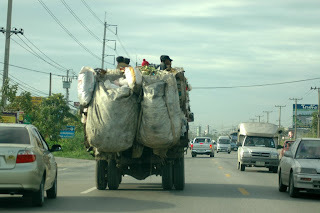 The last thing you want to do is give a Thai lorry driver the middle finger, only to find out that he is a complete maniac who lives on a diet of red bull and jaa ba and will think nothing of running you off the road!!! 5) Accidents. If there's an accident it's your fault. No, really, it's your fault!!! 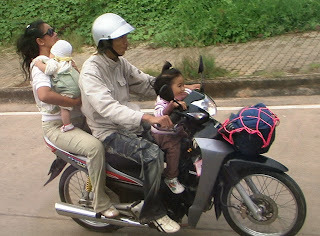 Trust me, this is the Thai way!!! As a foreigner you will be automatically blamed even if the other person was at fault. If you are involved in an accident you will almost certainly have to pay the other driver some compensation. 6) Police and "traffic fines". You will get stopped by the police eventually, this is an occupational hazard of driving in Thailand. In the event that it happens just pay up and get over it!!!! The following links also provide some more practical advice about driving and hiring vehicles.